An innovative system of composite, flexible reinforced RTP pipes. 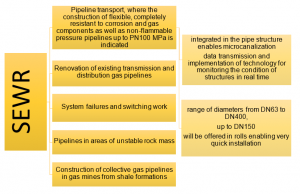 The purpose of the project is to develop and commercially implement an innovative system of composite, reinforced RTP (Reinforced Thermoplasic Pipe) pipes for medium and high pressure media. RTP pipes are flexible bonded structures, and the composites they are made of are fiber-reinforced laminates in a thermoplastic matrix. These pipes are similar to multilayer pipes made of fiber-reinforced thermosetting composites. However, the thermoplastic material for the pipes in question is more flexible, which makes it possible to use thermoplastic tubes under conditions of higher bending stresses. 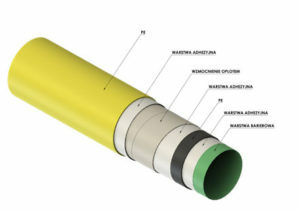 A novelty here is the combination of technical conditions with some aspects unique to bonded flexible thermoplastic pipes, and generally associated with thermoplastics. Other branches of the economy.